The Art Guy in his splint over the winter. One-handed typing stinks! Some of you good folk out there may have been wondering why the site hasn’t updated for a while. Yours truly, A&E’s tame In-House Graphic and Web Designer managed to fairly seriously injure myself a mere two weeks after Art & Elegance back in November. I stabbed myself in the right palm attempting to unjam a paper shredder. Yes, I know. Dumb as a bag of hammers. I’m glad I’m left-handed, but it was serious enough to require tendon repair surgery. 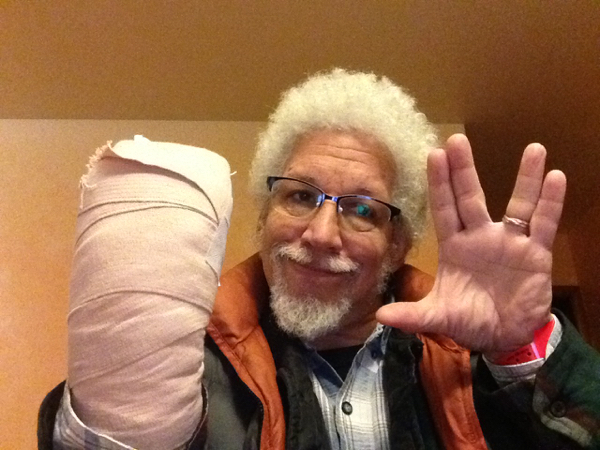 After six weeks in an immobilization splint, came out months behind on a pile of work.. And yes, including the actual keep-the-lights on work of the Studio. Doing better now and catching up, though probably going to need another procedure. But I am well enough and caught enough to get back to giving A&E some love. But that’s what went down, and we’ll be moving stuff forward again. Previous PostPrevious Prize Lists Posted! Next PostNext Proper Date Posted!